With its goal of following in the Spirit of God and the footsteps of Jesus, St. Paul’s Wolf’s ECC (Evangelical Covenant Church) gathers to enable and equip people to impact lives for Christ. Offering programs for adults, youth, children, involvement in a food bank, as well as a program to help the homeless, the church has numerous opportunities for its members to get involved. St. Paul’s Wolf’s recently completed a substantial overhaul of its AV infrastructure, which in addition to a new sound reinforcement system also included new projection capability. On the video side of the equation, the church is now equipped with projection technology drawn from the catalog of Rancho Santa Margarita, CA-based Eiki International, Inc.
Reynolds AV of East Berlin, PA, a full-service design / build AV firm specializing in audio, video, and lighting services, was contracted to design and deploy the church’s new AV equipment. Karl Reynolds, the firm’s Project Manager, coordinates system design, project management, plus customer training and service for the company. 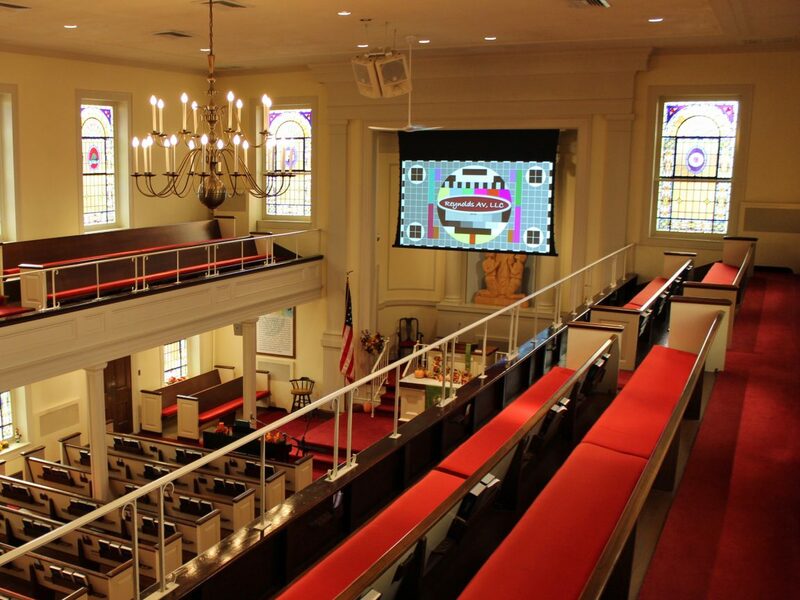 After consulting with church management to determine their goals and requirements for the facility upgrade, Reynolds elected to install an Eiki EK-811W, 8,000 lumen WXGA DLP® laser projector to handle visuals in the sanctuary. He discussed the project and his reasons for installing Eiki projection technology. For display of the visuals, the Reynolds AV team deployed a 65-inch high by 116-inch wide Draper screen designed for ambient light rejection. This is a ‘reverse roll’ front projection tensioned screen mounted behind the opening of the Chancel area. The Eiki EK-811W projector is located on the balcony at the rear of the sanctuary. Throw distance between the screen and projector is approximately 55 feet. For information about St. Paul’s Wolf’s ECC, go to www.wolfschurch.org. To learn more about Reynolds AV, visit the company online at www.reynoldsav.com.